Every true athlete knows that having a good coach is instrumental to developing the skills necessary to compete. For the rising stars of Bullfighters Only, that intense training comes in the form of the BFO Development Camps. A quick look at the Pendleton Whisky World Standings reveals just how successful the D-Camps have been, with several graduates showing success including Dayton Spiel, Colt Oder, Chance Moorman, Justin Ward, Andrès Gonzalez, Riley McKetterick and more. “The camp helped me by beating the fear of going up against a Mexican fighting bull,” said Gonzalez, who attended the D-Camp in San Bernardino, Calif., in the spring of 2017. “It made me more aggressive toward the bulls and taught me techniques as far as throwing fakes and making rounds with a bull. Gonzalez showcased that confidence on Labor Day weekend by winning the BFO stops at both Anaheim, Calif., and Fresno, Calif. He’s just another of the young guns who are bringing their talent to the premier freestyle bullfights in the game. Others will have those opportunities at the upcoming D-Camp in Decatur, Texas, on Oct. 26-28. Also in the top 10 in the standings are Ward and Moorman, two more bullfighters who came through this year’s D-Camps. With just two events this season under his belt, Gonzalez has moved to 20th. Bullfighters Only also offers something normal camps don’t: It has the full backing and support of Fit N Wise Sports Medicine. The Decatur D-Camp will once again utilize the world-class facilities at Fit N Wise while demonstrating the little things that help make a bullfighter successful. From proper training to nutrition secrets to the types of things the athletes need to do to care for and prevent injuries, Skates and his team take a hands-on approach with the campers. 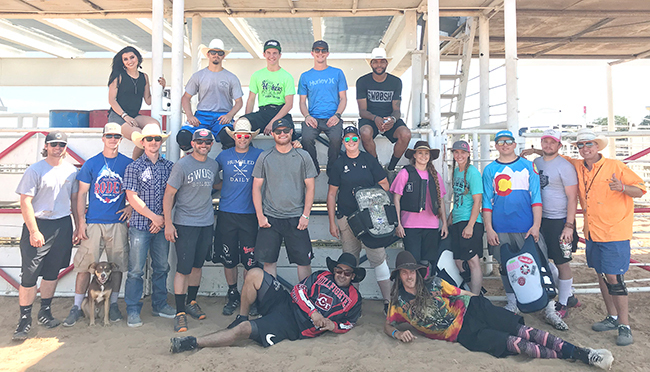 “They get to work with Clif Cooper, a trainer who knows these athletes,” Skates said of Cooper, a four-time National Finals Rodeo qualifier in tie-down roping. “Clif has been with us for 18 months and is definitely a big asset to our company. It’s that type of all-encompassing training that makes the BFO D-Camps an important fixture for young talent hoping to make a living in freestyle bullfighting.